A people's Declaration/Petition to the United Nations and the mainstream society at all walks of life, to be endorsed by the UN as a feasible roadmap for World Peace by means of phasing in the old, ancient, proven failed era and phasing in a new era of coexistence with the ecosystem, humanity and the animal world both wild and domestic. First initiated, published on social media March 2011 and mailed per registered surface mail 36 page hard copy document to the UN December 1, 2011. 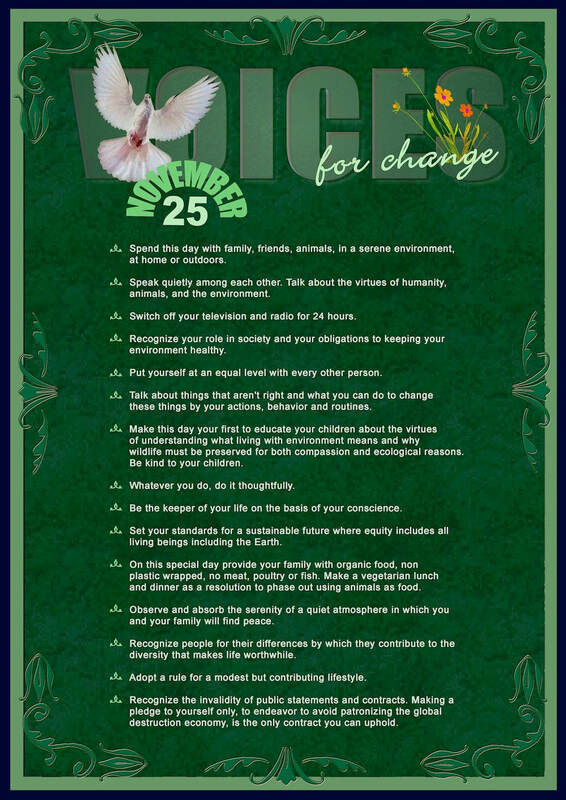 To this day, October 2018 (updated), this initiative has met with no response from the UN and has been received by the general social media public as something alien, something that throws familiar routines out the window - the "GREEN POSTER" below provides the possible answer to the reluctance to change ancient conditioned thinking and routines, there is however, a great deal more to it. The "November 25 Project" is totally independent from any government, religious institution, company, corporation, society, association, charity, petition site, etc.etc. It is maintained on an aged pension income, no donations are ever asked for - on the principle that Peace cannot be bought with money and that it can only be made possible by an overwhelming global citizens majority participated consensus. Attempts were made on many occasions for Facebook users to contribute by way of constructive comments, ideas and/or criticism, but on Facebook nothing of the kind ever eventuates beyond a two to three person exchange of words that have no impact on the grand scheme of things. convictions and facing a change of thinking and possible unfamiliar lifestyle are all too prevalent factors. As the initiator of this project for sake of World Peace for all concerned, with nothing personal to be gained whatsoever, I have been viciously attacked on just a few too many occasions, albeit by verbal attacks, but vicious nonetheless - with the effect that I have resorted to blocking such people and those who have the audacity to argue against any World Peace initiative irrespective of who takessuch initiative while millions of living beings are subjected to unimaginable suffering every single day. This site has not been edited for some time, due to 24/7 November 25 Project networking attempts via Facebook throughout 2017. All other pages in this site date back from approximately 1 to 5 years, much was re-edited from previous sites since 2010 that were closed due to the impossible task of trying to keep every site updated. In view of several issues pertaining the continuation of the project including this site, time and negative, irrelevant, abusive Facebook users responses and people riding on the back of this project for their own purposes on Facebook, 2018-19 will most likely see this mission impossible exit from the Facebook domain. Meanwhile however, please continue to visit this web site as items are still added frequently. ⬇︎ The "GREEN POSTER" in English - Refer to Site Map to see it in other languages. 2018 November 25 Posters Gallery as posted on Facebook. Click posters to enlarge.